I am starting a sketchbook here because, well it was about time, and I am ready to do a ton of work here as I heard some guy somewhere mention you apparently get a lot better with a high volume of work. I wanna take a stab at finnishing up 2 characters I have in the works, while working on refining general character art skills, like proportion, heads, anatomy etc. Lately I have started to try and get faster at heads and understand them better. and will probably do a bunch of those, feel free to let me know if you see something I am missing. The character I am currently working on, concept by marc scott. Next up I am gonna do another pass on the head, as I seem to have some proportion issues, and I want to get the ears and eyes to a better place aswell. Glad to be here, looking forward to seeing everyones work and hearing from all of you guys. Hey guys, little update here, Still a bit way to go in terms of detailing etc. but getting somewhere slowly. All the props need a pass more here. Also still working on quicksculpt heads! Continueing the work on this one, adding some more details and testing out some lowpoly bakes on the pants. keep it up, looking forward to see the final result! Alright, I have left this place untouched for too long, summer is over(was the hottest in a century though, so I’ll admit, staying inside was damn near impossible) and I am out of excuses. it is time to get back to the real work here. :)! @HannahKang Thanks a lot Hannah, I am looking forward to getting back to this character again. @michaelrobson Hey thanks a ton man, I hope you will enjoy the process onwards from here then :)! Alright, so I haven’t been entirely sitting on my hands, I recognized that I had a huge weak point when it came to game hair. So I decided to spend some time to get a good workflow for it, and I joined Johan Lithvall’s class on CGMA Hair Creation for Games (https://www.cgmasteracademy.com/courses/48-hair-creation-for-games). Great course, learned a ton and a much much better workflow. I like how my final asset for it turned out, though I see a lot of problems now that I am on the other side of the class, but starting over on it seems like a waste, so I would rather call it done and move on with my work here, and then look forward to doing more hair for the coming characters. well, I think that was all for today, glad to be posting in here again! How’s it Jeff! 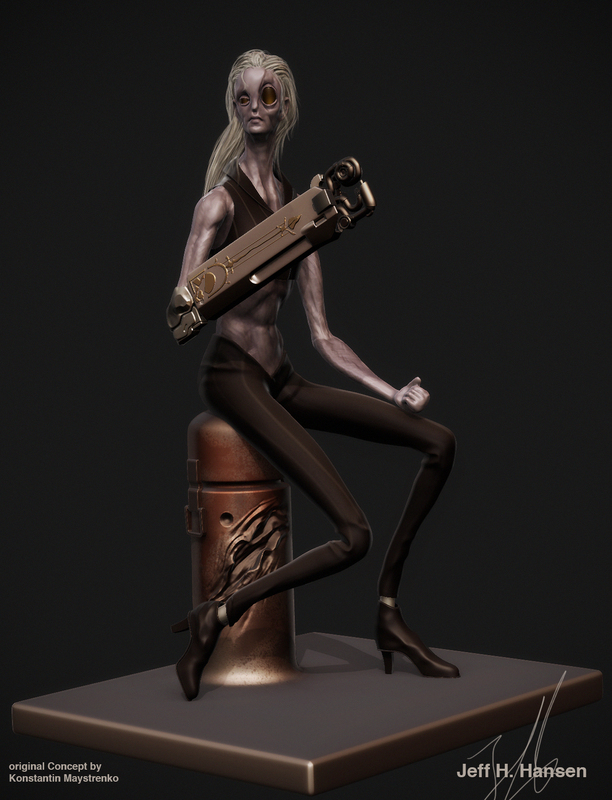 That’s a pretty cool character sculpt update based on Konstantin’s work. I love how stylized the forms are and how you handled the subtleties of the legs. Keep up the cool work Jeff. @michaelcabuco Hey thanks a lot mate! yeah konstantin do some cool work man, I just felt a little gist of inspiration ;)!